PBS Kids, the leader in children’s educational media, recently announced a new way for families to access educational content wherever they go with the launch of the PBS Kids Plug & Play. 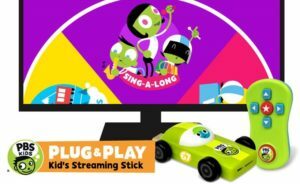 The first kids’ TV and playtime streaming stick, PBS Kids Plug & Play provides a one-stop destination for a variety of PBS Kids educational content. Pre-loaded with sing-alongs, exclusive games, and other original content that can all be accessed without Wi-Fi, PBS Kids Plug & Play transforms any TV into an interactive, safe, educational playtime experience. When connected to Wi-Fi, the PBS Kids Plug & Play’s features expand, offering free access to PBS Kids’ new 24/7 channel and live stream in partnership with local PBS stations, as well as more than 100 hours of on-demand videos, with no subscriptions required. Fresh content, including new videos, special seasonal content, and more, is also added regularly at no additional cost. PBS Kids, the number one educational media brand for kids, offers all children the opportunity to explore new ideas and new worlds through television, digital platforms and community-based programs. Kidscreen- and Webby Award-winning pbskids.org provides engaging interactive content, including digital games and streaming video. PBS Kids also offers mobile apps to help support young children’s learning. The PBS Kids Video app is available on a variety of mobile devices and on platforms such as Roku, Apple TV, Amazon Fire TV, Android TV, Xbox One, and Chromecast. For more information on specific PBS Kids content supporting literacy, science, math, and more, visit pbs.org/pressroom, or follow PBS Kids on Twitter and Facebook. The survey of 1,004 parents of children ages 2-6 was conducted November 30 – December 15, 2016, by Maru/Matchbox. Parents completed the survey online. The survey base is representative of TV-viewing households with young children with regards to household income and ethnicity.